“Hundreds of thousands of people are expected to descend upon Washington, D.C., and all 50 states on Saturday to protest the Trump administration’s ‘zero tolerance’ policy on immigration that’s sparked widespread debate after more than 2,000 children were separated from their parents at the U.S.-Mexico border. “‘(The) family separation crisis is not over. We have a situation where the Trump administration seems to be aiming to detain families,’ said Karthik Ganapathy, a MoveOn.org spokesman. “The more than 628 rallies held in response to President Donald Trump’s controversial policies – including family detention – are being organized by the Families Belong Together Coalition, which includes the National Domestic Workers Alliance, the Leadership Conference, MoveOn.org and the American Civil Liberties Union. “The ACLU said 300,000 alone will be in attendance in Washington, while MoveOn.org said Wednesday they expect tens of thousands of protesters in the nation’s capital. “Washington, D.C.’s Metropolitan Police Department declined to comment on crowd estimates for Saturday. The National Parks Service granted a permit Tuesday for an estimated 50,000 people for the nation’s capital rally. “Each state is expected to host at least one event, with some states, such as Texas and Massachusetts, participating in upward of 30 events. California anticipates being the state with the most events – at least 80 on Saturday, according to the Families Belong Together website. “The rallies are in response to a widespread desire among Americans to take action against Trump’s strict immigration policies, said Lorella Praeli, ACLU director of immigration policy and campaigns. “After Trump signed an executive order last week ending the family separations, a California judge ordered the Trump administration Tuesday evening to reunite the migrant families it had separated. “There are 2,047 children that must be placed in the same facility as their parents within the next two to four weeks. But U.S. law and a series of court rulings that limit the amount of time minors can be held in detention will further complicate those reunions. This from Facebook: “The Families Belong Together Protest hasn’t even begun and there’s a good 350 people in the protest versus 35 in the counter protest.” What’s up Todd Juvinall? ROFLOL. 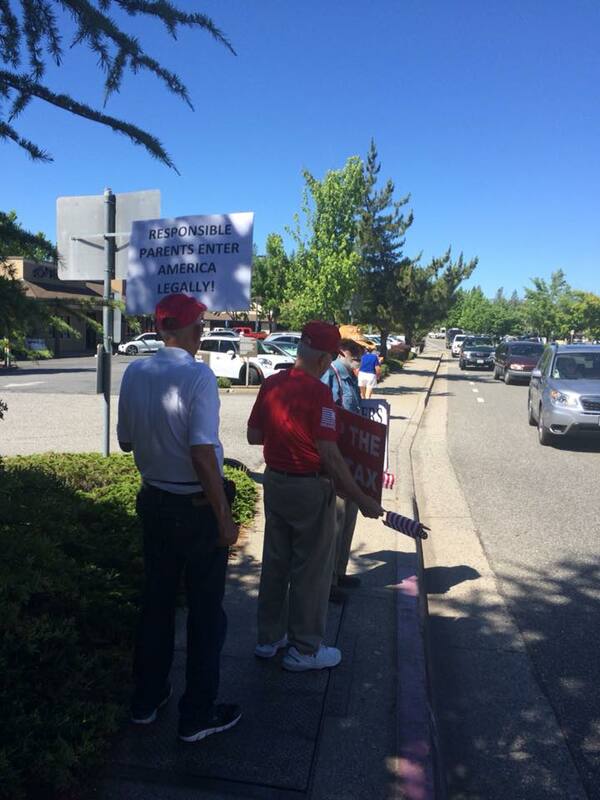 So, did Todd Juvinall show up at his own protest? Thanks for sharing the photos! Hope all is well. 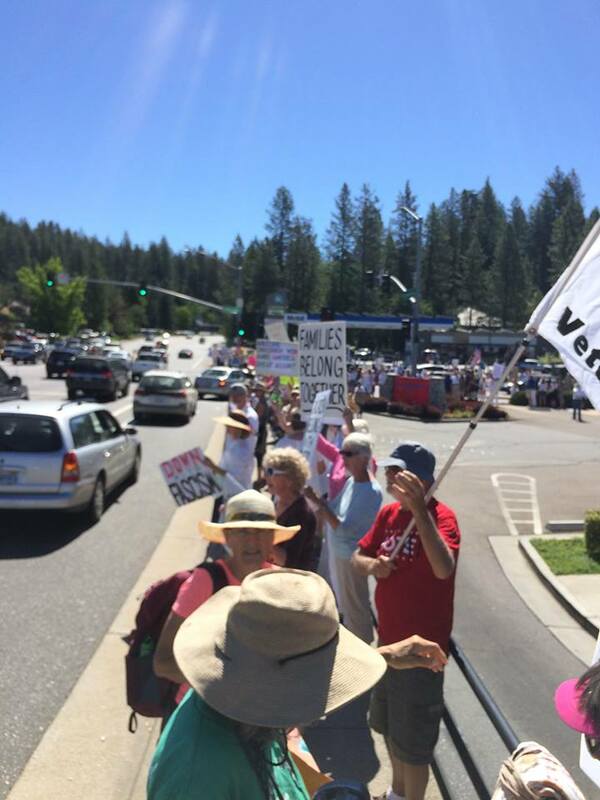 And YubaNet has this summary: “GRASS VALLEY, Calif. June 30, 2018 – Approximately 300 people gathered at the intersection of Brunswick and Sutton this morning to participate in the #FamiliesBelongTogether rally in Nevada County. Approximately 15 counter-protestors were also present at 10:00 am when these pictures were taken.” Yup, 300 to only 15. Todd’s blog post refers to a “large contingent” on his side. FAKE NEWS, to be sure! Actually by placing the protesters and the counter protesters in the same sentence in the lede The Union essentially created a rough parity in importance if not numbers. I find it subtly diminishing to the 300-400 protesters who showed up in support of asylum seekers and their children. Yes, The Union editors blew that. There was even a subhead that read: “Contingent of counter-prostesters crash party.” I have received many complaints about The Union’s handling of this article besides some posts here. Of course, The Union has the reputation of being The Tea Party Gazette. I don’t know how Yubanet gets 300 unless she was there at the beginning. At the height of the event we were well over 800 people. The sidewalks were packed. Yes indeed. We passed that intersection on the way to a celebration of live event east of town. I believe Pascale noted the photos were taken around 10 AM. Later is was packed. I believe your estimate is pretty close Reinette. “In the face of complacency from Republicans fearful of what attention to these intrigues might reveal about the Trump campaign’s dealings with Russia, Democrats on the Senate Foreign Relations Committee have issued a report that appears to be the most comprehensive public accounting of Russia’s war on the West. Needless to say, people on both sides of the aisle are deeply concerned about Russia’s “war on the West.” Maybe our Republican President should take a cue! BTW, the hashtag #walkaway ought to apply to Todd’s blog. lol. How come the characters on Todd’s blog don’t have the courage to sign their names? And why doesn’t Todd require that? The anonymity that Todd provides emboldens them to make more and more outlandish remarks, but it does not lead to informative discussions. More of a cesspit than a blog. Go figure! What drone bombing did (and still does) to turn people from other countries against America, child detention camps will encourage a whole new wave of hate.